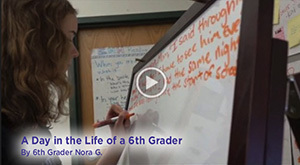 Enjoy this fun day-in-the-life video captured by 6th grade student Nora G.! Sixth grade is an energizing and thrilling adventure as students learn to flourish in the new and different world of the Middle School. Respecting each child’s individual learning style, teachers work to ensure that each student learns the material, gains confidence, and develops the skills necessary for a successful Middle School experience. Students will learn about and imagine life in other cultures and times, experiment in the lab, present their discoveries, analyze data to form their own conclusions, and reflect on their experiences and those of others. Field trips to Lowell Historical Park, Project Oceanology, and Riverbend Farm, which reinforce the learning in the classroom. Introductions to Spanish, Mandarin and Latin language and culture, and the annual International Breakfast. The Blackstone Valley Fair Project, in which the Blackstone Valley serves as an "outdoor classroom" for the students to learn about the history, economy, and culture of the region. Advisory Groups also begin in sixth grade. Each student is paired with a Middle School teacher who serves as an advisor. Small advisory groups meet each week to plan a path toward each student’s ideal future, while fostering decision-making and communication skills, and strengthening relationships outside of class.